Judging by the praise given to Star Trac exercise bikes – that they are classic in design, reliable, intuitive, comfortable, and so on – it would be fair to say they offer outstanding performance ride after ride. Star Trac is a leader in quality commercial fitness equipment. From treadmills and elliptical trainers to steppers and exercise bikes, Star Trac products are popular in health clubs, corporate fitness facilities, college, pro sports team facilities, and for home use with both the Star Trac and the ST Fitness brands. The most notable bit of information you should know about Star Trac is that it began the spin revolution at fitness centers when it licensed from Mad Dogg Athletics, Inc, a line of Spinner® bikes that set the standard for indoor cycling equipment. Packed classes for Spinning® programs have made these indoor cycles the most widely used exercise bikes in the world. You can find popular Star Trac bikes at almost any local health club or public recreation facility. Starting prices for Upright bikes is around $2,195 while Recumbents start at $2,495. The Star Trac S-Series upright and recumbent exercise bikes have custom steel frames, one-piece cranks with sealed bearings, a self-contained power supply, and a Polar® telemetry and contact heart rate system. The new models of recumbents even have armrests and are as comfortable as a great chair. The advanced E-Series bikes are pre-wired for the Star Trac entertainment solution, including a 15" personal viewing screen and controls integrated into the display. There is also a base 8 series on the upright and recumbent models. 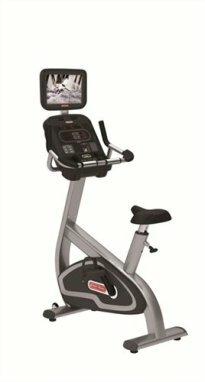 Star Trac also offers the Indoor Cycling Bike Series, With Studio 3, Studio 5 and Studio 7 models. These are highly adjustable, well-designed and solidly built machines with 41 lb. flywheels, forged steel frames and super-quiet belt drives. Let’s talk about the club quality Spinner exercise bikes: they have a weighted 43-lb flywheel that simulates the feel of riding a real bike outdoors. Components on the 140-lb frame include toe cage straps on the dual-sided pedals, Star Trac’s Smart Release™ braking system, pop pin adjustments on the seat and handlebar post, an ergonomic saddle with anatomical cutout, easy-dial resistance knob, and much more. Prices for the basic model start at $895, and go up to $1,595 for the Star Trac Spinner® NXT, the world’s best-selling Spinner exercise bike. 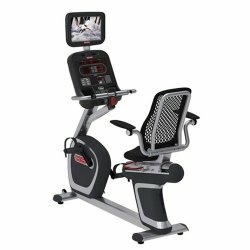 The state-of-the-art eSpinner® at $4,395 has a touch screen display that puts a virtual Spinning® master instructor right in front of you. Instead of fighting traffic to go to Spin class, have the class right at home. Most helpful exercise bike reviews point out that these award-winning models offer nothing less than real club quality. The Spinner® cycles excel at high intensity training while the recumbents and uprights are in constant use in the cardio room of any health club. They are sturdy, quiet, and comfortable, and are backed by excellent customer service. For the home user, Star Trac exercise bikes are expensive but if money is not a factor, then this brand is a good choice for a high-end bike. Star Trac eSpinner - The eSpinner features a weighted 43-lb flywheel that simulates the feel of riding a real bike outdoors. The display screen provides the ultimate in at-home, state-of-the-art training. Star Trac NXT Indoor Bike - This is the one to buy if you are serious about owning a quality spin bike. Used exclusively for spin classes since the construction of the NXT has proven itself the best on the market. Star Trac S-UBx Upright Bike - Reviews are positive in terms of attractiveness and programming, but on closer look this model doesn’t live up to the Star Trac appeal. Star Trac S-RBx Recumbent Bike - A nice but expensive machine with comfortable armrests and wrap-around seat, with a feel that is comparable to a health club exercise bike. Star Trac E-RBe Recumbent - One of the longest recumbent models at 66" and the heaviest, so expect the ride to be very stable, with a pedaling motion that is smooth and quiet. Star Trac E-UBe Upright - Reviews on this model are favorable although they question the high price for the home model. Not too many people are willing to spend almost $4,500 on an exercise bike.